Cellulitis is a localized bacterial skin infection, which typically affects the lower limbs but can occur on any area of skin and underlying subcutaneous tissue. It is characterized by acute onset of redness, inflammation, pain, and swelling of the affected area. Accompanying symptoms include generalized fever, rigors, nausea, and vomiting. The infection is most commonly caused by B-Hemolytic Streptococci bacteria and reoccurs up to 50% of the time in the lower extremity. 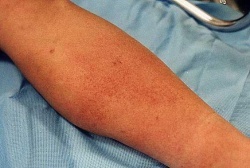 Most individuals diagnosed with cellulitis have a low risk of severe complications but few sufferers can have severe sepsis, local gangrene, and/or necrotizing fasciitis. 650,000 hospital admissions per year in the United States are due to cellulitis. When hospitalized, patients with recurrent cellulitis require longer hospitalizations relative to nonrelapsing cellulitis patients. Typical symptoms include acute poorly demarcated and spreading erythema along with pain, swelling, and warmth of the lower extremity but can occur on any area of skin or underlying subcutaneous tissue. Additional symptoms may include fever, nausea, vomiting, and rigors. Other features include proximal dilated and edematous skin lymphatics and bulla formation. Cellulitis predominantly has a unilateral presentation, most commonly in the lower extremity. Diabetes Mellitus is one of most common comorbidities among those hospitalized for acute bacterial infections including cellulitis. Following a cellulitis infection, those with diabetes require a longer course of antibiotic therapy and are more likely to have an outpatient follow-up visit. Lymphatic flow changes can predispose individuals to a cutaneous infection. Examples of co-morbidities that result in lymphatic flow changes include peripheral vascular disease, liposuction, radiation therapy, lymph node dissection, and lymphedema. Cephalexin, Dicloxacillin, Penicillin VK, Amoxicillin, and Clindamycin are typical Antistreptococcal Antimicrobial agents for the treatment of typical cellulitis that is considered mild and does not show signs of systemic involvement. 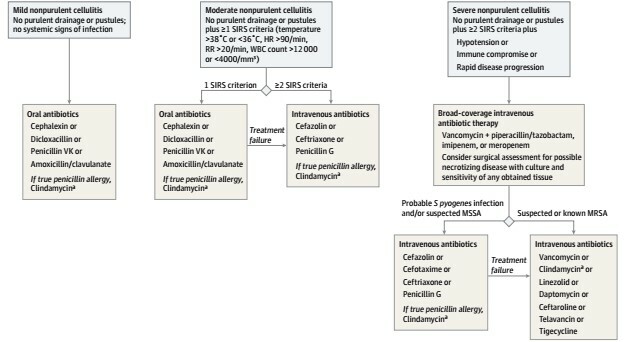 Table 1 indicates which medications would be appropriate based on the severity of symptoms and the risk of Methicillin-resistant Staphylococcus aureus (MRSA). Imaging studies can identify more severe infections to differentiate from cellulitis, but are not a reliable diagnostic tool for cellulitis itself. Identification of the cause of the infection through blood, needle aspiration or punch biopsy are not recommended unless the patient has a complication or abnormal exposure history. This would include immunosuppressants, a diagnosis of chronic liver disease, aquatic soft tissue injury, animal and human bites, or being in contact with various bacterias. If a biopsy and culture are warranted, a histopathologic evaluation will be performed on the sample. Hematoxylin-and-eosin and certain stainings for organisms, bacteria, fungi, and microbacteria will be included. Cellulitis can be caused by various organisms but most commonly by Streptococcus pyogenes or Staphylococcus aureus. The organisms may enter the body after a cut, bite, or wound that compromises the skin or may enter through microscopic changes in the skin. They enter the dermis and multiply to cause cellulitis. Studies show lymphedema is a major risk factor for the development of cellulitis. There is known to be a link between the two, but it is not known which of the two comes first. Patients with lymphedema or chronic edema are more prone to infection due to damage to lymphatic vessels and immune deficiency in that area. Cellulitis on the other hand, can cause damage to the lymphatics and the development of lymphedema. Cellulitis can be found anywhere on the skin, and can cause systemic issues in those areas. Locally, cellulitis often results in significant tissue damage in the involved area. Cellulitis can spread systemically through the lymphatics and blood stream, which can lead to further complications. If cellulitis does spread systemically through one of these systems, it can cause flu-like symptoms such as fever, rigors, nausea, and vomiting. 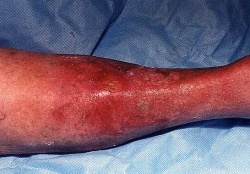 Though rare, there is a risk for severe sepsis, gangrene, or necrotizing fasciitis if cellulitis spreads systemically and is left untreated. Currently, there are no published national guidelines for the treatment of cellulitis. Although there are no national guidelines, there are two classification systems based on expert opinion that may be used. The Eron Classification system is the most widely used and is described in Table 2. A more recent classification system, The Dundee Classification, was released in 2010. Table 3 compares these two classification systems based on strength of evidence, validation, and criteria. Most common management of the infection is administration of antibiotics. In more severe cases of cellulitis, intravenous antibiotics can be used. Elevation and compression of the affected area promotes drainage of edema and can reduce inflammation, speeding up recovery. For those with recurrent cellulitis, prophylactic antibiotic therapy is an option. Recent studies show that antibiotic prophylaxis substantially reduced the number or recurrences experienced by patients while actively taking the medication. Although there is reduction during the antibiotic therapy, there is no evidence of persistent protect effect after it has ceased. Below is a treatment algorithm for Non-purulent Cellulitis, as described by Raff et. al. While there is lack of evidence that discusses specific physical therapy interventions for cellulitis, therapists should be aware of the signs and symptoms in order to refer the patient appropriately. Physical therapists should have awareness of risk factors and various causes of cellulitis, in addition to signs and symptoms. According to some references, there are some modalities that physical therapists can use for a patient with cellulitis. Rest and elevation of the affected limb is important and can help alleviate pain. The application of cool, wet, sterile bandages is also recommended for pain relief, and ice can be used as well. Massage to promote lymphatic drainage, may help prevent cellulitis, particularly when used in conjunction with compression and exercise. However, it should not be used during an active cellulitis infection. A diagnosis other than Cellulitis can be due to infectious, inflammatory, vascular or neoplastic conditions. These are discussed in Table 5. The following video link by dermatologist Dr. Noah Craft MD, PhD, DTMH discusses Cellulitis from the provider point of view and includes case studies, differential diagnosis, and treatment approaches. ↑ 1.0 1.1 1.2 Mason JM, Thomas KS, Crook AM, Foster KA, Chalmers JR, et al. Prophylactic Antibiotics to Prevent Cellulitis of the Leg: Economic Analysis of the PATCH I and II Trials. PLoS ONE. 2014;9(2):e82694 http://journals.plos.org/plosone/article?id=10.1371/journal.pone.0082694 (accessed 28 Feb 2017). ↑ 2.0 2.1 Tsai C-YL, Calvin MK, Chung C, Susan Shin-Jung L, Yao-Shen C, Hung C. Development of a prediction model for bacteremia in hospitalized adults with cellulitis to aid in the efficient use of blood cultures: a retrospective cohort study. BMC Infectious Diseases. 2016;16(1):581. ↑ 3.0 3.1 3.2 Medscape. Cellulitis. http://emedicine.medscape.com/article/214222-overview (accessed 27 Feb 2017). ↑ 4.00 4.01 4.02 4.03 4.04 4.05 4.06 4.07 4.08 4.09 4.10 4.11 4.12 4.13 4.14 Raff AB, Kroshinsky D. Cellulitis: A Review. JAMA. 2016;316(3):325-37. http://jamanetwork.com/pdfaccess.ashx?url=/data/journals/jama/935437/ (accessed 27 Feb 2017). ↑ 5.0 5.1 5.2 Kilburn SA, Featherstone P, Higgins B, Brindle R. Interventions for cellulitis and erysipelas. (Cochrane review). Cochrane Database Syst Rev. 2010(6):CD004299. ↑ 6.0 6.1 Bailey E, Kroshinsky D. Cellulitis: Diagnosis and Management. Dermatologic Therapy. 2011;24:229–39.http://onlinelibrary.wiley.com/doi/10.1111/j.1529-8019.2011.01398.x/full (accessed 15 Mar 2017). ↑ Jenkins TC. Comparison of the Microbiology and Antibiotic Treatment among Diabetic and Non-Diabetic Patients Hospitalized for Cellulitis or Cutaneous Abscess. J Hosp Med. 9ADADDec12;:788–94.https://www.ncbi.nlm.nih.gov/pmc/articles/PMC4256165/ (accessed 28 Feb 2017). ↑ 8.0 8.1 8.2 8.3 Riches K, Keeley V. Cellulitis in patients with chronic oedema. Nursing & Residential Care [serial on the Internet]. (2012, Mar), [cited March 31, 2017]; 14(3): 122-127. Available from: CINAHL with Full Text. ↑ Phoenix G, Das S, Joshi M. Diagnosis and management of cellulitis. BMJ [Internet]. 2012Jul [cited 2017Mar20];345(aug07 2):38–42. Available from: http://www.bmj.com/bmj/section-pdf/187604?path=/bmj/345/7869/Clinical_Review.full.pdffckLRMedscape. Cellulitis. http://emedicine.medscape.com/article/214222-overview (accessed 27 Feb 2017). ↑ 12.0 12.1 Phoenix G, Das S, Joshi M. Diagnosis and management of cellulitis. BMJ [Internet]. 2012Jul [cited 2017Mar20];345(aug07 2):38–42. Available from: http://www.bmj.com/bmj/section-pdf/187604?path=/bmj/345/7869/Clinical_Review.full.pdffckLRMedscape. Cellulitis. http://emedicine.medscape.com/article/214222-overview (accessed 27 Feb 2017). ↑ University of Maryland Medical Center. http://umm.edu/health/medical/altmed/condition/cellulitis (accessed 25 March 2017).